It’s back to school bus safety time! You know, that time of the year when the leaves begin to change colour and the streets, parks and playgrounds are busy with kids of all ages returning to school. Whether this is the first time your children are taking the bus or the one thousandth, safety reminders are always important. Returning to school from summer break and catching up with friends is at the forefront of their minds. Just as motorists need to pay extra care, parents and children need to remember some basic safety tips when going to and returning from school. 1. Ensure that your child is properly registered to ride the bus and confirm that your contact information and address is up to date. Even if your information hasn’t changed, it’s important to check annually to ensure that it’s accurate. 2. Make sure that you or someone authorized by you is there to meet your child(ren) at the bus stop and have a contingency plans in place in case you run late. Some plans may involve waiting at a neighbour’s or ensuring your children have access to your home in case they’re old enough and close enough to walk home. Switzer-Carty Transportation is pleased to participate in this safety message from the Peel Regional Police. All aboard for bus safety! 3. Be aware of the dangers around a school bus pickup and drop off zone. There are many blind spots around a bus and it should not be approached until it is completely stopped. Waiting a safe distance from the curb where the driver can see you is very important for back to school safety. 4. When riding the bus, make sure you are sitting properly, feet forward and sitting upright, to minimize the risk of injury should the bus need to stop suddenly. Facing backwards, standing or lying down can increase your chance of injury in the event of a sudden stop as you are not prepared and will be off balance, leaving you unable to brace yourself properly. 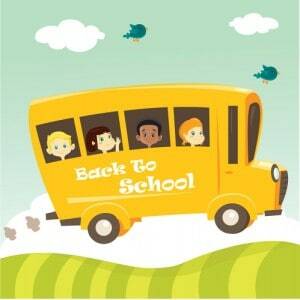 School buses utilize “compartmentalization“, which is a safety feature and part of school bus design construction. 5. When on the bus, keep all belongings on your lap and keep the aisles clear to prevent anyone from tripping while also facilitating an evacuation if needed. 6. Keep the noise level on the bus to a minimum as the driver needs to concentrate on traffic and the road ahead. Loud talking, music or screaming can distract the driver and cause an accident. 7. No wrestling, running or horseplay is allowed on the bus. Everyone needs to remain in their seats while the bus is moving. Moving about and horseplay can distract the driver and also put the riders at higher risk of injury should the bus make any sudden movements or stops. 8. No drinking or eating on the school bus. Food and drinks can be a choking hazard and should only be consumed during designated break times. Also, in a confined space food allergies and sensitivities may be heightened (always have your epi-pen handy!). Don’t overload your kids’ backpacks. A heavy load will throw off their balance and increase the chance that they trip and fall. By reviewing these 9 basic tips for back to school safety, you can breathe a little easier knowing that your child or children are safe and sound in their travels to and from school. These tips are particularly important to follow for first time riders as they wouldn’t have had any prior exposure to these safety rules and may be overwhelmed by the whole experience.